In June 1941, the Navy issued the first production contract for the somewhat revised F4U-1 model and the basic design continued in production until January 1953, at which time over 12,800 Corsairs of all models had been built. One of the basically stock Corsairs still active is F4U-1 Bu No .17799 (civil registration NX83782), which belongs to Planes of Fame Air Museum at Chino Airport in Southern California. It first arrived at San Diego, California in August 1943 and was assigned to a Navy fighter squadron (VF84) in the same year. In January 1944, the aircraft was reassigned to VBF-14 (a fighter-bomber unit) until being transferred to VBF-98 in February 1945. From the sketchy records available, it appears that this aircraft actually saw combat service in the Pacific with VBF-14 and/or VBF-98. The Corsair was dubbed the "Whistling Death" by the Japanese because of the noise that it made in high-speed flight. Between April and June 1945, Planes of Fame's Corsair served with a carrier air support unit (CASU-33) before being withdrawn from active service on August 31, 1945. After being sold on the surplus market, 17799 wound up in use as a Hollywood movie prop at the Twentieth Century Fox Studios until it was eventually acquired by Planes of Fame Air Museum in 1970, but did not go on static display at Chino until 1973. 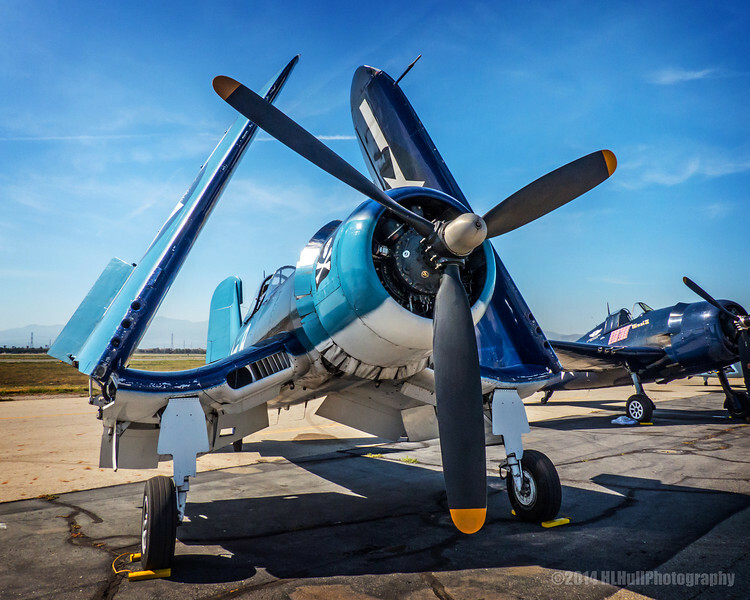 In 1976, Jim Maloney and Steve Hinton restored the Corsair to flying condition in basically a stock F4U-1 configuration. The primary changes to the aircraft it that it uses a Pratt & Whitney R-2800 engine with a single-stage supercharger from a Douglas A-26 Invader bomber in place of the two-stage, two-speed, supercharged R-2800-8 engine that was more common to the early model Corsair fighters. As a result, the restored Corsair is about 700 lbs. lighter than a stock aircraft, allowing it to have a better rate of climb at low altitudes and a shorter take-off roll. Since restoration, the Corsair has taken part in numerous airshows and flown in a variety of Hollywood productions including the Baa Baa Blacksheep television series, Airwolf, Space, an IMAX film and an ABC Wide world of flying video. Planes of Fame's F4U-1A is currently the oldest airworthy Corsair in the world. Very well captured and interesting info! Very neat plane...love the folded wings! This is so cool with the blue sky. Nice shot of the Corsair. You can't tell it from your shot, but this is a physically very imposing plane when you stand close to it. Wonderful capture! I like the comp and POV.